Previously, TP53 codon 72 polymorphisms have been implicated as risk factors for various cancers. A number of studies have conducted on the association of TP53 codon 72 polymorphisms with susceptibility to breast carcinoma and have yielded inconclusive results. The aim of the present study was to derive a more precise estimation of the relationship. We conducted a search in the Medline, EMBASE, OVID, Sciencedirect, and Chinese National Knowledge Infrastructure (CNKI) without a language limitation, covering all papers published up to Jan 2009. The associated literature was acquired through deliberate searching and selected based on the established inclusion criteria for publications. A total of seventeen case-control studies, including 12226 cases and 10782 controls, met the included criteria and thus were selected. Ultimately, the relevant data were extracted and further analyzed using systematic meta-analyses. Overall, no associations of TP53 codon 72 polymorphisms with breast carcinoma were observed (for Arg/Arg vs Pro/Pro: OR = 1.20; 95%CI = 0.96–1.50; for dominant model: OR = 1.12; 95%CI = 0.96–1.32; for recessive model: OR = 1.13; 95%CI = 0.98–1.31). In the subgroup analysis by ethnicity, statistically similar results were obtained when the data were stratified as Asians, Caucasians and Africans. Collectively, the results of the present study suggest that TP53 codon 72 polymorphisms might not be a low-penetrant risk factor for developing breast carcinoma. Breast cancer is the second leading cause of cancer death in women, exceeded only by lung cancer in the world . It is believed that some epidemic factors such as Oral contraceptive use ; obesity  and hyperinsulinemia  are probable factors increasing risks of developing breast carcinoma. Although many individuals exposed to these risk factors, breast cancer develops only in a small group of exposed people, implying that genetic factors might contribute to the carcinogenic mechanisms and complex interactions between many genetic and environmental factors might be the major cause of breast cancer. Previously, a number of studies indicate that family history is a risk factor for breast cancer , indicating the possible roles for genetic variations on the increased susceptibility to breast cancer. Recent published meta-analyses suggest that polymorphisms of Fok1 , XRCC1 codon 399 and methylenetetrahydrofolate reductase might have a significant association with increased breast cancer risk. Nevertheless, conversely, some meta-analysis failed to suggest a marked association of increased susceptibility to breast cancer with polymorphisms of some genes, such as Estrogen receptor alpha , CYP1A1  and base-excision repair pathway genes . Recently, a growing body of research has conducted on the association of breast cancer risk with tumour suppressors. TP53, one of the most extensive studied genes as a tumor suppressor, has been thought to have a critical function in cell cycle regulation. In case of its mutation, this regulation could be lost, resulting in cell proliferation without control and development of cancer. Previously, TP53 mutation has been indicated to associate with risks of a number of cancers such as lung cancer, breast cancer  and colorectal cancer . The loss of TP53 gene could damage its DNA-binding properties and transcription factor function, thus leading to aberrant cell proliferation. In human populations, the TP53 gene is polymorphic at amino acid 72 of the protein that it encodes. Recently, much attention has been focused on possible associations of TP53 polymorphisms and cancer risks. The most informative polymorphism in TP53 gene is located in exon 4 at codon 72, which encodes two distinct functional allelic forms arginine (Arg) and proline (Pro) because of a transversion G to C , resulting in different biochemical and biological protein features. Consequently, three distinct genotypes were created, namely, homozygous for arginine (Arg/Arg), homozygous for proline (Pro/Pro), and heterozygous (Arg/Pro). Previously, Arg variant has been thought to increase susceptibility to gastric cancer and Arg homozygosity might contribute to cervical cancer . Nevertheless, Pro homozygosity might have an association with lung  and hepotocellular cancer  risk. The heterozygous genotype Arg/Pro has been implicated as a risk factor for bladder cancer . In recent literature, inconclusive data regarding TP53 codon 72 were found in some cancers, such as gastric cancer in which controversial conclusions were obtained in Asians  and in individuals from Northern Brazil . Similarly, up to date, published data on the possible association of TP53 codon 72 polymorphism with breast carcinoma have also generated controversial and inconclusive results. To the best of our knowledge, whether TP53 codon 72 polymorphism could increase breast cancer risk remains largely uncertain. To clarify this association may help us better understand the possible risk of breast cancer and therefore contribute to its prevention. As a single study may have been underpowered in clarifying the relationship of TP53 codon 72 polymorphisms with breast carcinoma susceptibility, in the present study we performed evidence-based quantitative meta-analyses that can increase statistical power to address the association. We carried out a search in the Medline, EMBASE, OVID, Sciencedirect, and Chinese National Knowledge Infrastructure (CNKI) without a language limitation, covering all papers published up to Jan 2009, with a combination of the following keywords: TP53, P53, codon 72, breast, carcinoma, neoplasm, tumor, cancer and polymorphism. The keywords were paired each time in order to get more relevant information. For example, the word "breast" was always kept and others were substituted in different moments. 6. The methods of data collection and analysis should be statistically acceptable. 1. The design and the definition of the experiments were obviously different from those of the selected papers. 3. The genetic distribution of the control group was inconsistent with Hardy-Weinberg equilibrium (HWE). 4. Reviews and duplicated publications. After searching, we reviewed all papers in accordance with the criteria defined above for further analysis. Data were carefully extracted from all eligible publications independently by two of the authors according to the inclusion criteria mentioned above. For conflicting evaluations, an agreement was reached following a discussion. If a consensus could not be reached, another author was consulted to resolve the dispute and then a final decision was made by the majority of the votes. The extracted information was entered into a database. For data not provided in the main text, the relevant information was obtained by contacting corresponding authors as possible as we could. The odds ratio (OR) of TP53 codon 72 polymorphisms and breast cancer risk was estimated for each study. The pooled ORs were performed for additive model (Arg/Arg vs Pro/Pro), dominant model (Arg/Arg+Arg/Pro versus Pro/Pro) and recessive model (Arg/Arg versus Arg/Pro+Pro/Pro), respectively. For detection of any possible sample size biases, the OR and its 95% confidence interval (CI) to each study was plotted against the number of participants respectively. A Chi-square based Q statistic test was performed to assess heterogeneity. If the result of the heterogeneity test was P > 0.05, ORs were pooled according to the fixed-effect model (Mantel-Haenszel), Otherwise, the random-effect model (DerSimonian and laird) was used. The significance of the pooled ORs was determined by Z-test. The HWE was assessed via Fisher's exact test. Publication bias was assessed by visual inspection of funnel plots, in which the standard error of log (OR) of each study was plotted against its log (OR). An asymmetric plot indicates a possible publication bias. The symmetry of the funnel plot was further evaluated by Egger's linear regression test. In addition, fail-safe number for P = 0.05 (Nfs0.05)  for the evaluation of the reliability of meta-analysis, defined as the number of negative results that could reverse the significant findings, was also used to estimate the robustness of the meta analysis. Statistical analysis was undertaken using the program Review Manager 4.2 and SAS 8.1 software. 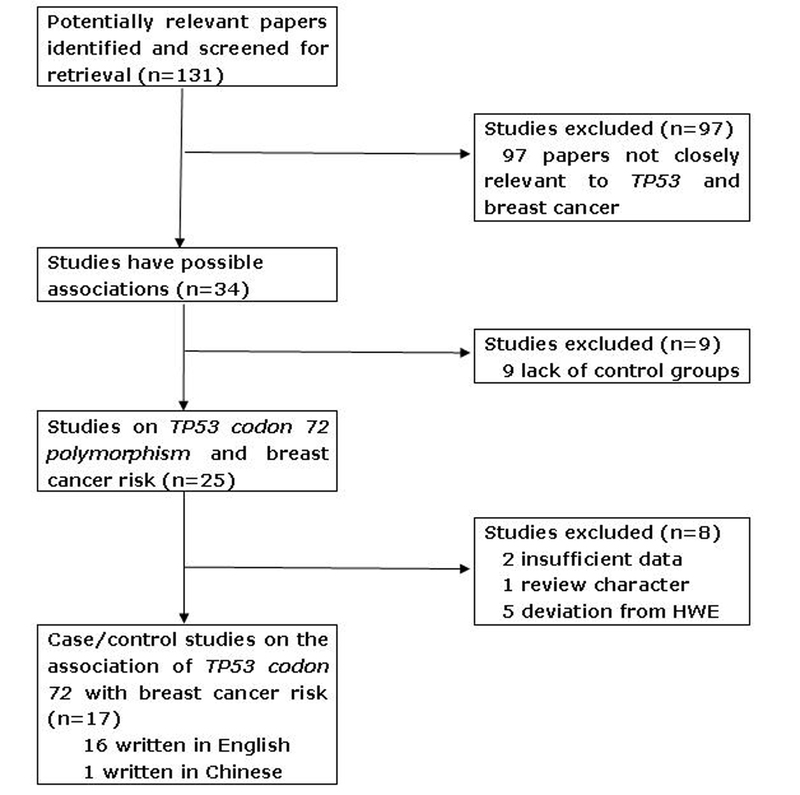 A total of 131 studies regarding TP53 codon 72 with respect to breast cancer were searched and screened for retrieval, of which 97 irrelevant studies were excluded. Then, 9 studies [26–34] were excluded because each of them did not contain a control group. Next, of the remaining 25 studies, 2 studies[35, 36] were excluded due to their insufficient data and 1 study  owing to its review characteristic. Afterwards, another 5 studies [38–42] were excluded because the genetic distributions of the control groups were not in agreement with HWE. Lastly, 17 case-control studies were selected (Figure 1). Of the all included 17 studies, 16 were written in English [43–58] and 1  in Chinese. We established a database according to the extracted information from each article. The relevant information was listed in Table 1. According to the lists, the first author and the number and characteristics of cases and controls for each study as well as other necessary information were presented. As shown in Table 2, the distributions of TP53 codon 72 genotype of the included studies were also presented. The controls of the included studies were all in accordance with HWE. We analyzed the heterogeneity of Arg/Arg versus Pro/Pro and dominant model (Arg/Arg+Arg/Pro versus Pro/Pro) as well as recessive model (Arg/Arg versus Arg/Pro+Pro/Pro). As shown in Table 3, the heterogeneity for the overall data was significant in each of the above three models respectively because the P values were less than 0.05 for Q-tests. Thus, random-effect models were utilized for the meta-analyses. Table 3 lists the main results of the meta-analysis. No evidence showed that individuals who carry Arg allele have an increased or decreased risk of breast carcinoma compared with those who carry Pro allele. In the present study, a total of 17 studies were included. Nevertheless, the study conducted by Weston et al. concerned both Caucasians and Africans. Thus, the data were extracted respectively and further assessed by Revman 4.2 software. Consequently, the following results reported 18 studies. As shown in Table 3, for Arg/Arg vs Pro/Pro, the data available for our meta-analysis were obtained from 18 case-control studies of 7377 cases and 6450 controls, of which 6288 cases and 5112 controls had the Arg/Arg genotype and 1089 cases and 1338 controls had the Pro/Pro genotype of the TP53 codon 72. The overall OR was 1.20 (95% CI = 0.96–1.50) and the test for overall effect Z value was 1.58 (P > 0.05). For dominant model (Arg/Arg+Arg/Pro versus Pro/Pro), the data available for our meta-analysis were obtained from 18 case-control studies containing 12226 cases and 10782 controls, of which 11137 cases and 9444 controls had the combined genotypes of Arg/Arg and Arg/Pro, while 1089 cases and 1338 controls had the homozygote Pro/Pro genotype. The overall OR was 1.12 (95% CI = 0.96–1.32) and the test for overall effect Z value was 1.47 (P > 0.05). Similarly, for recessive model (Arg/Arg versus Arg/Pro+Pro/Pro), the data were extracted from the 18 case-control studies concerning 12226 cases and 10782 controls, of which 6288 cases and 5112 controls had the wild-type homozygote Arg/Arg genotype while 5938 cases and 5670 controls had the combined variant genotypes (Arg/Pro and Pro/Pro) of the TP53 codon 72. The overall OR was 1.13 (95% CI = 0.98–1.31) and the test for overall effect Z value was 1.65 (P > 0.05). Considering the possible impact of ethnic variation on the results, we conducted subgroup analysis concerning Asians, Caucasians and Africans, respectively. Likewise, the subgroup analyses failed to suggest marked association between TP53 codon 72 polymorphisms and breast cancer risk in Asians, Caucasians and Africans. In order to compare the difference and evaluate the sensitivity of the meta-analyses, we also presented the results of the fixed-effect models as listed in Table 3. In all, the results were not significantly different between the two models, suggesting the robustness of the meta-analyses. Moreover, we also conducted one-way sensitivity analysis to evaluate the stability of the meta-analysis. The statistical significance of the results was not altered when any single study was omitted (data not shown), confirming the stability of the results. Hence, results of the sensitivity analysis suggest that the data in this meta-analysis are relatively stable and credible. Funnel plots were created for assessment of possible publication biases. Then, Egger's linear regression tests were used to assess the symmetric of the plots. As shown in Table 4, for the dominant model, the data suggest that the funnel plot is symmetrical. However, for the additive and recessive model, the results indicate possible asymmetric of the funnel plots. Therefore, we further calculated the Nfs0.05 for evaluation of the stability of the results. Consequently, the Nfs0.05 were 237, 143 and 271 for additive, dominant model and recessive model respectively, which were more than five times of the number of the included studies, suggesting that the results of these meta-analyses are relatively stable and the publication biases might not have an evident influence on the results of the meta-analyses. In the present study, the results of meta-analyses showed that individuals with TP53 codon 72 polymorphism might not have significant associations with increased or decreased susceptibility to breast carcinoma. A previous meta-analysis conducted by Koushik et al. regarding cervical cancer suggests that homozygote Arg/Arg genotype increases susceptibility to both squamous cell carcinoma and adenocarcinoma. While another meta-analysis  indicates that Arg/Arg genotype only associates with increased risk of cervical adenocarcinoma but not squamous cell carcinoma. Then, Sousa et al. failed to demonstrate Arg/Arg genotype as a risk marker for the development of cervical lesions in most of European countries. Conversely, nonassociations of TP53 codon 72 polymorphism with lung carcinoma  and gastric cancer  risk were found by meta-analysis. Nevertheless, An updated meta-analysis concerning lung cancer implied that Pro allele is a low-penetrant risk factor for developing lung cancer . Thus, whether TP53 codon 72 polymorphism contributes to susceptibility to cancers varies in different types of cancer. In the present study, no evidence showed TP53 codon 72 polymorphism as a risk factor for breast cancer. The underlying mechanisms by which TP53 polymorphism influences cancer risk are not fully understood. TP53 is the most frequently investigated gene that is often mutated in a variety of cancers. Nevertheless, several single-nucleotide polymorphisms have been studied and reported in TP53 gene . The polymorphism of TP53 codon 72 occurs in a proline-rich region that is thought to play a critical role in the growth suppression and apoptotic functions of TP53 protein . The two polymorphic variants differ in their capability of binding the transcriptional protein, activating transcription and suppressing the transformation of some primary cells . For example, Arg variant might induce cell apoptosis and suppress transformation more efficiently than Pro variant do, which may be due to the ability of the Arg variant to localize in mitochondria that regulates the release of cytochrome c into cytosol. However, the present meta-analysis indicates that neither Arg nor Pro carriers may have a significant association with breast cancer risk. It is likely that TP53 codon 72 polymorphisms rarely affect the tumorigenesis and progression of breast carcinoma. Considering that the same polymorphism may play different roles in cancer susceptibility among different ethnic populations and the frequencies of single nucleotide polymorphisms may be different ethnicity, we stratified the data by race into three groups concerning Asians, Caucasians or Africans, respectively. Ultimately, statistically similar results were obtained, confirming nonassociation of TP53 codon 72 polymorphism with breast cancer risk. A well-known risk factor, HPV infection, is thought to have an association with increased susceptibility to some cancers such as cervical  and oral cancer . Evidence suggests that P53Arg72 protein may be more susceptible than P53Pro72 protein to HPV mediated degradation, thus increasing risk of HPV associated cancers . Growing body of literature indicates HPV infection as a possible risk factor for breast cancer . However, we did not further investigate the possible association of HPV infection with TP53 codon 72 polymorphism due to the insufficient data in the primary included studies. Heterogeneity is a potential problem when interpreting the results of meta-analysis . In the present study, significant between-study heterogeneity existed in overall comparisons. Nevertheless, when the data were stratified by race, the heterogeneity was decreased or removed, suggesting that differences of genetic backgrounds and the environment existed among different ethnicities. In the present meta-analysis, we excluded the studies in which the control groups were deviate from HWE. Thus, the between-study heterogeneity might be reduced. Moreover, random-effect models were used for combination of the data. Accordingly, the results may be credible and stable although the heterogeneity seemed evident. Some limitations might be included in this study. First, in this meta-analysis, most published studies and papers written in English or Chinese were searched. Moreover, although papers written in some other languages, cited by PubMed, were also searched, it is possible that some related published or unpublished studies that might meet the inclusion criteria were missed. Hence, some inevitable publication biases might exist in the results, though the Nfs0.05 showed no remarkable publication biases in the meta-analyses. Second, in the subgroup analysis, the number of studies regarding Africans was relatively limited. It may be underpowered to explore the real association. Thus, the results may be interpreted with caution. Third, whether the experimental and control groups were from the same socio-economic status or the same geographic area have not been clearly presented in some of the included original papers, leading to any possible biases. Furthermore, the sample sizes of some included studies are rather small, which might be one of the reasons contributing to the between-study heterogeneity. Therefore, a number of further studies with large sample sizes with well-matched controls are required. Besides, gene-gene and gene-environment interactions should also be considered in the further studies. In summary, despite the limitations, the results of the present meta-analysis suggest that genetic variations of TP53 codon 72 may not have a marked association with breast cancer risk. WZ and YZ conceived of the study, and carried out the analysis of the literatures and drafted the manuscript. ZX carried out the collection of the literatures. LC helped with the statistical analysis and manuscript drafting. ZC and WZ conceived of the study, and participated in its design and coordination and helped to draft the manuscript. All authors read and approved the final manuscript.